Below you will find what Marius believes to be wonderful books to learn from and continue your dog education with your furry friend. Some books Marius has personally read and may leave a note about some books found below, but the books that Marius has not yet read, he still listed them below due to a respect to the authors work or has personal knowledge that the books recommended below are full of great mind expanding knowledge and are also on his "Need To Read Bookshelf". Any text following "-----" is copy/pasted book description from Amazon.com for your convenience. I believe that this is a must read for all pet parents. This book is a great guide for all new puppy owners, and the techniques work well with newly adopted dogs even if they aren't puppys.... these techniques will work with a dog that is even 10 years old. Note: Amazon is not selling this book directly, you will have to click on the "New from other sellers" button and Cattle Dog Publishing is actually Dr. Sophia Yin's publishing company, so you would still get a new book and be buying directly from Dr. Sophia Yin. This book and it's author is so wonderful, you can actually download the Free Puppy Potty Training Guide (From ch. 2 of Perfect Puppy in 7 Day) by following this link and entering in some information, believe me, it's not a scam. ----- With 400 photos and a step-by-step plan, this puppy book visually guides you through socialization, potty training, and life skills while making the process fun. Dr. Marty Becker; "America's Veterinarian" of Good Morning America, says, "This is like no other puppy book you've seen before. It’s not just about teaching your puppy manners, it's a step-by-step recipe for bonding with your puppy, learning to communicate with him, and preparing you pup for life! With Dr. Yin's approach your puppy will learn more in a week than many dogs learn in a year!" Victoria Stillwell from Animal Planet's "It's Me or the Dog" says, " This book is a must-have for any puppy parent or canine educator." Dr. Johan Bradshaw, author of "Dog Sense" says, "This book is a comprehensive and humane guide to puppy behavior and training, incorporating a detailed guide on how to interpret your puppy's body language. Worth buying for the socialization advice and checklist alone." Dr. Ellen Lindell, veterinary behaviorist, states, "This well-organized book is filled with essential information about puppy development and learning. Experts and novices alike will appreciate the illustrations and analogies that turn science into a clear and enjoyable read. Most important, Dr. Yin offers a plan that incorporates critical socialization and training into a daily routine. It will be a puppy life-saver." Nancy Abplanalp of "Thinking Dogs" says, "I own tons of dog training books and none of them are as much fun to read as this one. It's accurate and easy to access. The puppy socialization chapters and checklist are especially well done. If you have a puppy, work with puppies, raise puppies, or just plain like puppies, get this book. Although you may not be aware of it, every interaction you have with your dog is a training session--with each pat on the head, cluck of disapproval, or offer of a treat, your dog is learning something. Whether he is learning something you want him to learn is another matter. If you want a well-behaved dog, you're going to have to modify your own behavior in order to modify his. The best way to achieve this is to understand how dogs think and learn. Dr. Sophia Yin, a respected animal behaviorist, provides an in-depth approach to not only understanding dogs, but also understanding how to effectively communicate with them. As you read about the practical aspects of learning theory, you will realize what motivates your dog, then apply Dr. Yin's scientifically-based training methods to get the results you want. Exercises for training and problem solving are broken down into short, easy-to-read sections, and friendly, instructional illustrations enhance the techniques. The positive approach to correcting and training your dog's behaviors will help you see the world from your dog's perspective and provide the necessary training tools to effect amazing behavioral changes. • Positive Socialization and What to do if Your Dog is Frightened? A wonderful quick read with plenty of pictures and a DVD, available separate, that goes over dog body language and how we can help to calm our dogs lives and the ones we meet in the world. A definite read for all pet parents! Is walking your dog a tug-of-war? At last, a simple way to teach your dog to walk on a leash without pulling your arm off! Norwegian dog trainer, Turid Rugaas, internationally known for her ground-breaking work on canine body language and author of On Talking Terms with Dogs: Calming Signals, turns her attention to the common problem of dogs that pull while on a leash. In My Dog Pulls. What Do I Do? you will learn Turid s quick and easy method to train any age, size or breed of dog to walk calmly and quietly on a loose leash. Her approach is humane and based on a solid understanding of why dogs pull and how to work with the dog s nature and the environment to overcome the problem. City, town or country walking will become more relaxed, reducing stress for dog and owner. My Dog Pulls explains: Why dogs develop pulling problems. Simple steps to retraining even a vigorous puller. How to rehabilitate the puller with clear, helpful photographs. Correct use of leashes, collars and harnesses. What works, what doesn't. Troubleshooting problems that arise in training. Barking is one of the many ways dogs communicate with each other and with humans. Think of barking as part of your dog s language. When a dog barks, he is expressing something and you can learn to understand what he is he is trying to say. In this book, author Turid Rugaas, well known for her work on identifying and utilizing canine calming signals, turns her attention to understanding and managing barking behavior. If you can identify what your dog is expressing when he barks, you can take steps to minimize the negative effects of barking in cases where you find it a problem. What if the secret to great dog training is to be a frequent feeder; rather than a strong leader? A skilled reinforcer rather than a strict enforcer? Over the past two decades, countless dog trainers across the world have embraced the liberal use of positive reinforcement. Often accompanying this trend, however, is an underlying emphasis, inherited from more coercive models of dog training, that each human in the family must be the dog's leader. But adopting the role of leader using what is known as the Nothing in Life is Free; training protocol can result in stifling rules that constrain a person's ability to share affection and attention with their dogs. This focus on human leadership puts puts the burden on dogs to earn; their rewards rather than placing the primary responsibility on the humans to be generous, precise, creative feeders; (i.e., reinforcers). In this new book, renowned dog trainer Kathy Sdao reveals how her journey through life and her decades of experience training marine mammals and dogs led her to reject a number of sacred cows including the leadership model of dog training. She describes in narrative fashion how she has come to focus her own training philosophy which emphasizes developing partnerships in which humans and dogs exchange reinforcements and continually cede the upper hand to one another. With Decoding Your Dog the experts’ experts deliver a must-have dog behavior guide that ultimately challenge the way we think about our dogs. 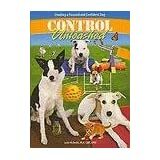 The main difference as someone described to me about the two different Control Unleashed books is that the puppy one is preventative while the original Control Unleashed book is how to solve the same attention issues that you are actually training into your puppy with the Puppy Program book. I read the Puppy Program and I think it is an amazing read and program for your puppy to be trained in everyday life. I plan on reading Control Unleashed as well. 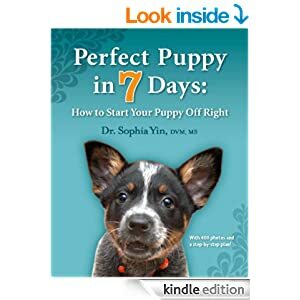 If you have a puppy, this book is a must along with Dr. Sophia Yin's book. Control Unleashed®: The Puppy Program is meant as "preventive medicine" for puppy raisers. Many common behavior problems can be either prevented or minimized by starting a puppy with good foundation training from the beginning. In addition, this book provides a program that will help you create a puppy that is ready for sport-specific training at the appropriate age-a puppy with the ability to focus on whatever you want, for as long as you want, whenever you want. The techniques found in this book are great to have in your repertoire when training your dog through fear, anxiety, etc. This protocol focuses on using distance away from the trigger stimulant, the book does also include an optional food reward to be given, and I truly believe that pairing it with food will be a great help (if your dog enjoys food as a top reinforcer), if I was working with a more ball oriented dog, I would give the dog a ball to carry/squish in their mouth as an additional reinforcer to the distance. How to encourage or shape a replacement behavior that provides your dog the same functional reward as reactivity. Why it is important to keep your dog calm in the presence of a trigger while teaching him to make good choices. Step-by-step instructions needed to stage BAT set-ups to work with your dog in a controlled environment. Practical ways to keep your dog from being pushed into a reactive state in and around your home and on walks. How to use BAT preventively for puppy socialization. Positive Answers for the Aggressive Dog. The dog that bites. The dog that attacks other dogs. The dog who may not survive his own aggressive behavior. What can be done to help these dogs? When Emma Parsons, canine behavior consultant, discovered that her own dog was aggressive, she developed innovative and effective strategies to calm, alter, and re-shape his reactive displays, and those of her clients' dogs. This is the book that got me into Clicker Training and I can not recommend it enough. It's a wonderful read with many great anecdotes and stories. From the founder of “clicker” training, the widely praised humane approach to shaping animal behavior, comes a fascinating book—part memoir, part insight into how animals and people think and behave. A celebrated pioneer in the field of no-punishment animal training,Karen Pryor is responsible for developing clicker training—an all-positive, safe, effective way to modify and shape animal behavior—and she has changed the lives of millions of animals. Practical, engrossing, and full of fascinating stories about Pryor’s interactions with animals of all sorts, Reaching the Animal Mind presents the sum total of her life’s work. She explains the science behind clicker training, how and why it works, and offers step-by-step instructions on how you can clicker-train any animal in your life. Don't let the title fool you as it may have many before, you will not find this covers a lot of dog training, but does encompass training, teaching, learning theory and the like. Also a great book to have on your book shelf. 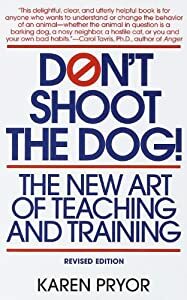 Karen Pryor's clear and entertaining explanation of behavioral training methods made Don't Shoot the Dog! a bestselling classic. Now this revised edition presents more of her insights into animal—and human—behavior. Learn why pet owners rave, "This book changed our lives!" and how these pioneering techniques can work for you too. A renowned dog trainer gives you the positive training tools you need to share a lifetime of fun, companionship, and respect with your dog. Plus, you'll get: information on the importance of observing, understanding, and reacting appropriately to your dog's body language; instructions on how to phase out the use of a clicker and treats to introduce more advanced training concepts; a diary to track progress; suggestions for treats your dog will respond to; and a glossary of training terms. A complete dog training, puppy raising, problem solving, and basic health guide. Written as a series of columns in Whole Dog Journal , Positive Perspectives gives you information on day-to-day living with dogs in small easily understood bites . Find out how to prevent problems before they occur, train without force with fun and treats, learn about the newest vaccination schedules and much more to live happily with your dog. For puppy as well as adult dog owners. I believe this is a wonderful book for potential adopters as well as people who have adopted a young or adult dog from a shelter or rescue. This will put many things into perspective and can be a big help when choosing the right dog for you and your lifestyle. What exactly is a Do-Over Dog? It might be a shelter dog you re working with to help her become more adoptable. Perhaps it s the dog you ve adopted, rescued, or even found running stray who is now yours to live with and love...forever. Or it could be the dog you ve lived with for years but you realize he still has issues that make him a challenging canine companion. A Do-Over Dog is any dog that you think needs make that deserves a second chance in life. Noted author and trainer Pat Miller has spent her life working with both people and shelter dogs, family dogs, and dogs with behavior problems. In her newest book she shares the wisdom of her years in the field of force-free, positive dog training to help give people and pets a first class life together. It s not too late to begin again Learn how to assess any dog in order to anticipate his behavior and training needs. Find out how to make the best use of the Honeymoon Period when it s important to teach new behaviors and establish good habits. Discover the best way to deal with problem behaviors that are common in Do-Over Dogs including fear, resource guarding, and separation anxiety. Educate yourself about using a combination of positive training and common sense management techniques to bring out the best in your new dog. You Can Build a Bridge to a Better Life for Dogs Pat Miller s How to Foster Dogs is the first book on the market to deal specifically with the care and training needs of foster dogs and how the fostering process works when done through a formal arrangement with an organization like a shelter or breed rescue group. Fostering dogs involves caring on a temporary basis for puppies and dogs who for whatever reason cannot be housed with their owners, shelters or breed rescue organizations. Many shelters now have formal fostering programs for dogs who are too young, unhealthy or have behavioral issues and therefore have to be housed with a foster family or face euthanasia. The book also covers informal fostering situations when families move or have some disruption and a friend or relative agrees to care for the dog temporarily. You will learn About the various organizations that seek the services of foster families for dogs. What a typical formal arrangement between a shelter and a foster parent involves including expectations of care and training, and the support you can expect from the shelter including covering expenses and other legal issues. About the most common behavioral issues facing foster dogs and puppies including fear and separation anxiety, a likely undeserved reputation for what may have been perceived as dominance, and irritating but usually solvable problems such as house soiling, chewing and barking. How to successfully integrate a foster dog into your home if you own other dogs. While it is possible that you will end up adopting the dog yourself, learn how to prepare to say goodbye to your foster best friend knowing that you have done your best to build a bridge to a better future for him or her. A wonderful book and will change some of your perspectives on training and how you connect with your dog. A wonderful read and great techniques in this gem! Many training strategies and behavioral modification programs focus on changing dogs' behavior. The latest book and DVD set by popular British dog trainer and ClickerExpo faculty member Kay Laurence introduces another mindset. In Every Dog Every Day, Kay describes a different view of your dog's innate behaviors, and explains how trying to suppress these innate responses can be met with resistance and conflict. Kay's suggestion is to think about working with the grain, not against it, to move closer to an enjoyable connection and relationship with your dog. Kay has lived with many dogs over many years, observing their daily interactions and their puppy-rearing and sharing in their activities. With skill, dogs teach us the art of living as a harmonious group, and the art of developing connection. This understanding is shared through the book and DVD set, with advice based on consistent, high-quality results with a range of dogs and people. This DVD is formatted in the PAL format and can only be viewed on a computer or select DVD players that support PAL. We can teach with exquisite precision and achieve error-less results when we fully understand every component that affects our learners' learning experience. Quality teaching begins with awareness of our interaction with the learner, and continues with taking responsibility for improving our own competencies, not just those of the learner. Examining 1% of the learning cycle that can make 100% difference to the result. Does it matter how the learner acquires the behaviour? Can the reinforcing process strain the behaviour? Are we teaching the way that learner chooses to learn or just teaching the way we like to teach? As revolutionists we can filter our choices with deep respect for our learners that comes from our heart, not just from a scientific view point. The way a behaviour is carried out is more important than the behaviour itself. Clicker revolution began with talented behavioural scientists and evolved through hundreds of practioners to where we are today. We are presented with a wealth of principles, theories, strategies and techniques. These are often flavoured with tradition and superstition. Clicker revolution continues with a critical eye and evolving ethical values, which help us bring to light shadowy areas of protocols that were once accepted as "good enough". This clarity of understanding, combined with good practice, sets up both learner and teacher for success. Our clicker is the gateway to reinforcement. This book and DVD set: Clicker Training: The Perfect Foundation is perfect! Combined from the very successful Foundation and Novice books of the Clicker Trainer's course, it becomes the essential route to teach yourself clicker training. Learn the skills of using and managing rewards, how and why the clicker works, adding names of behaviours, basic shaping and targeting techniques. Enjoy the challenge of planning your dog's learning, breaking the behaviours into small achievable chunks and develop your shaping skills. Finally taking this creative and careful learning through to ultra reliable behaviors and at the same time having great fun with your dog. Play is a natural form of learning. It varies from frivolous to intensely serious. It resolves conflict, strengthens bonds and provides physical workouts. Participants learn to play by rules and develop cunning strategies and solutions. During games players are not focussing on specific skills and their bodies and minds can learn effectively. They will be stretched physically and mentally. This book covers a range of over 50 Games and variations selected from the rich background of Kay's teaching practice. You can build a specific curriculum for your dog or simply enjoy the teaching learning process. Levels 1-3 are wonderful manuals to put your dog through some amazing training with simple steps to follow. See these volume sets as training manuals like sheets of music. The Level 1 Foundation Course teaches the key skills of using and managing rewards, how and why the clicker works, adding names to behaviors, basic shaping and targeting techniques. The Level 2 Novice Course builds on the key skills acquired in the Foundation Course. Learning how to break down the behaviors into small achievable chunks and to develop shaping with built in platforms. How the rewards can affect behaviors and using shaping to get the precise results you are looking for. Finally taking this creative and careful development process through to ultra reliable and strong behaviors and at the same time having great fun with the dog. This book covers many types of positive reinforcement training as used in clicker training, first learning, instinctive behaviours and lifestyle management. It will question your concept of rewards and bring you closer to exceptional effectiveness and a greater understanding of your dog's behaviour. This book I believe would have techniques for Free Style dancing with your dogs. The recipes are based on clicker training skills achieved in the Clicker Trainers Course books, level 1 & 2, Foundation and Novice training. Generations of dogs have been labeled training-lemons for requiring actual motivation when all along they were perfectly normal. Numerous other completely and utterly normal dogs have been branded as canine misfits simply because they grew up to act like dogs. Barking, chewing, sniffing, licking, jumping up and occasionally, (just like people), having arguments, is as normal and natural for dogs as wagging tails and burying bones. However, all dogs need to be taught how to modify their normal and natural behaviors to adjust to human culture. Sadly, all to often, when the dog's way of life conflicts with human rules and standards, many dogs are discarded and summarily put to death. That's quite the Culture Clash.